In September 2015, I was appointed as Special Advisor on Indigenous Children in Care. Since that time, I have travelled to many Indigenous communities to hear directly from the families and communities about their children who are in care. In every community where I was invited, I was acknowledged and treated with kindness and respect. I heard voices of concern, frustration and, at times, anger. Always, however, there was strong optimism and hope expressed for a better future for our children and grandchildren. I was honoured, many times, when Chiefs, leaders, parents, extended families, children, and youth shared intimate details of their difficult and often wrenching experiences with the existing child welfare system. 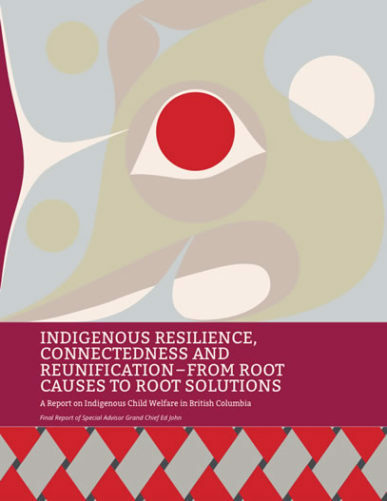 While the recommendations in this report are often supported through existing statistical data, studies, and other documented research findings, it has been my goal to ensure that these stories I heard and the issues identified by the children and youth, parents, and communities themselves – those with whom I met and those who reached out to me – were told in a strong way. Summary of recommendations from the Report of Special Advisor Grand Chief Ed John.